Make your own dried olive savoury biscuits to serve on their own, or topped with blue cheese, a strong cheddar or my new favourite, Maasdam. Both our Jack Russell’s are rescue dogs. Misty came to us with a skin disorder that got worse and worse regardless of how we treated it. Our vet, who I trust implicitly, did not want to put her on cortisone due to the long term damage it can do to her liver. But a few months ago her skin was causing her to be irritated all the time. She was fighting with Molly so badly that Dave got bitten twice. I considered giving her away as I was concerned she would kill Molly or end up being killed herself. Before heading down a drastic route I decided to take her to the vet for her annual appointment one month early. We negotiated a course of cortisone in the hope that the long term risk would be outweighed by the short to medium term gain. She started off on 2 tablets every day for 5 days and this was then reduced to 1 tablet a day for 5 days. The aim is to wean her to a dosage that is as infrequent as possible but keeps her skin clear. The first night of 1 tablet every 2 days was the night Dave joined me in Johannesburg. The following day he told me that I would be amazed at how good natured she was. Her skin was soft, her fur thicker and she was actually wagging her tail and playing with Scarlett. After 10 days we reduced the dosage to every 3 days and took a huge step back. Straight away she started scratching, her skin was red and she was irritable. She attacked Molly and ended up with two deep gashes on her leg where Molly bit her back. Immediately I put her back onto a nightly dose and within 3 days she was a friendly dog. Of course Molly is still wary of her as for 2 years they have been in a lot of fights. Dave and I decided that a shorter happier life would be much better for her, and for the other two dogs as well. I also decided for a change to make savoury biscuits instead of buying them. 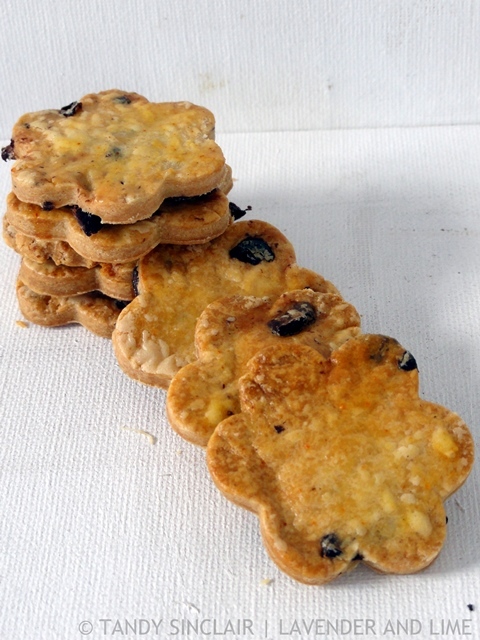 Here I have made Dried Olive Savoury Biscuits and the effort is really worth while. I would recommend making half of this batch at a time, or freezing the left overs if you don’t feel like cooking up the entire lot. These look so good Tandy. 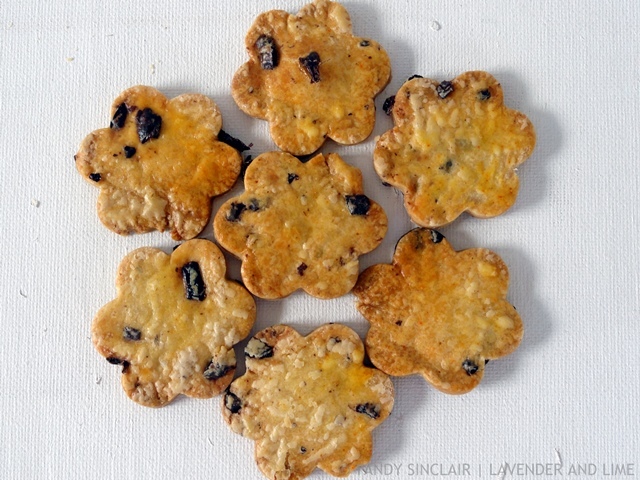 I’m always on the look out for new savoury biscuit recipes so have bookmarked this one. Coincidentally, I just bought a wedge of Maasdam yesterday. This would be great with a running, ripe blue cheese! It is making me hungry. It is definitely about quality of life for Misty and also for everyone around her. Thankfully she has such a caring a patient home. I’m not usually big on olives but I would try these because they look and sound great! Your biscuits sound delicious, Tandy. wonderful! they look so pretty. I adore olives and any dish that includes them gets my vote! I’ve never seen dried olives at the market, I’ll look out for them. Or you could try and dry your own? I want these wiyh some dip of sundried tomatoes. I could finish the whole batch! Love olive breads but never had olive biscuits. These sounds like an amazing idea. Can’t wait to try these crunchy crispy bites! I’m not a fan of olives but these look delicious. Oh wow – that Cortisone sure did help Misty – what a difference a happy dog makes – and what a delicious difference homemade savory biscuits make! She is like a puppy now! Hi Tandy, this is my kind of biscuits, love the combo of flavors you used. So sorry about your dog, they sure know how to work their way into our hearts. I am very excited to try these. I think we could probably replace the olives with many other things like sage or rosemary would also work. Right? Those look lovely. I’ll take savory over sweet anytime. Anything cheese and salty gets a thumbs up from me! I ate a whole tub of olives in one go at the weekend. Ooops! Love the shape of these biscuits! Shape means so much in food I think! My parents Jack Russell is a rescue and not a very happy one unfortunately, not good natured like yours. She really wants to be the only pet in the home and when I dog sit (which is quite a bit of the time since my parents travel a great deal out of the country) she is not happy with my 2 dogs. But we get through it! Mine was exactly the same until we put her on the cortisone. But she is still very jealous and does not like the other dogs near me. Iyour poor dog. Eczema is agony. The more you scratch the more you want to scratch. A human remedy is to mix a paste of bicarbonate soda and water and cover the itchy inflamed patch before it gets too bad. Whatever you are washing your dog with could also add to the problem. Would love to try one your biscuits. Would love you to come and visit! Delicious recipe! Can’t wait to try it! But, whhhaat, my cat was called Misty and my dog is Molly! I thought I was reading something I wrote! I don’t use it for my pups as we have no health issues with them but have heard so many good things about the all round benefits of a raw food diet and also including turmeric in their food. Might be worth investigating. Hope all continues well with the dogs ? And on to the recipe! Lovely biscuits, think we’d really enjoy these. Wow the medication really made a world of difference! These biscuits look so good too! I’ve never had olive biscuits-breads yes but not biscuits. Ohhhhhh wow! Anything crunchy/crispy totally ticks my box but with olives and cheese too? Delicious! I love the flavours you’ve got going on here Tandy!